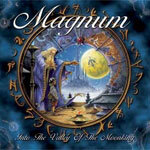 Veteran UK melodic rockers Magnum are back with their fifteenth studio album, Into The Valley Of The Moon King. Expect another fine disc of melodic rock from the principals, vocalist Bob Catley and guitarist/songwriter/producer Tony Clarkin. Magnum is not deviating from their chosen path. If anything, they're moving closer to AOR and farther from the progressive tendencies found in the recent past. Mostly, Magnum is comfortable like your favorite old shirt and loafers on a soft summer day. Into The Valley Of The Moon King has an atmospheric and airy feel suitable for that lazy afternoon of that summer day. Catley's vocals and Mark Stanway's keyboards swirl like whispers of wind around the oaks of Clarkin's electric guitar and willows of his acoustic. This music may more inspire you to quaff another draught or pour another burgundy and relax than speculate upon the intricacies of song arrangement. The music is not uninteresting, just incredibly soothing. And herein may lie the inherent problem with Into The Valley Of The Moon King: it may be too sedative to be compelling, although in all parts it's very good. But there are songs, like Take Me To The Edge, Feels Like Trahison, and the early rocking Blood On Your Barbed Wire, which add a degree of liveliness to that slothful summer afternoon. Into The Valley Of The Moon King finds Magnum nearly reserved, almost contemplative, and sounding like a band more comfortable with fine wine in a library than a pint of draught in noisy, smoky pub. It's all light and comfortable, a familiar Magnum that longtime fans will find pleasing. Into The Valley Of The Moon King finds Magnum nearly reserved, almost contemplative, and sounding like a band more comfortable with fine wine in a library than a pint of draught in smoky pub. It's all light and comfortable, a familiar Magnum that longtime fans will find pleasing.